You'd think because we have a 3 car garage that we would have plenty of space. This is in addition to a full basement. But, it hasn't ever been tidy, at least not the way I would like it. If it were up to me we would have all 3 sides of the garage lined with 8 ft white cabinets -- WITH DOORS. And nothing on the floor! In my dream home I would have my own garage and it would be neat and tidy. Ahh, but I live with a man who has tools -- and lots of them. He also has stuff for his work. And then there's the lawn mower, and gardening things. That was the 3rd bay. The double part of the garage wasn't so bad because I parked my car in it & kept the right side nearest to the door swept and somewhat tidy. We definitely wanted to make the garage look presentable, so we started with painting the floor with a special concrete floor paint. The floor looked pretty good when it was finished. Then the walls were painted a really pretty shade of gray. 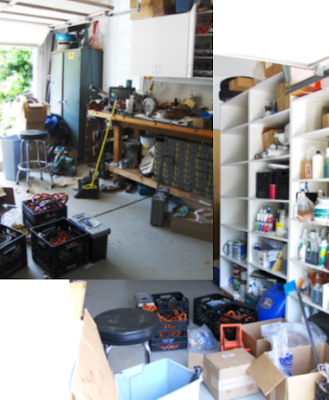 We still hadn't organized the 3rd section of the garage until this weekend. And it was soooo hot out there. But Mr. DIY braved the heat and cleaned it up. We did a curb alert on the gray cabinet & the one in the other corner too. This is what my third of the garage looks like. Not perfect, but oh, so much better. These are the cabinets near the door to the house. I keep light bulbs, batteries, extension cords, shoe stuff, etc. in the plastic bins. I also keep a shelf full of extra rags. And here are the shelves in Mr. DIY's workshop area. The shelves are filled with painting stuff on the left, tools in the middle & work stuff on the right. And the workbench side ... I think this is as good as it is going to get, but if it were up to me .... oh, I'm sure you can guess! I would like to know how all of you handle all of your stuff that goes in the garage. Are you like my next door neighbor whose garage is so clean you could throw a party in it on any given day? Or do you have lots of stuff? I would love to know! Hope you all had a great weekend! I hope it wasn't near as HOT as it was here!! Pam, at least you have shelves and cabinets. All our stuff lies around on the floor and then ends up in a utility room on the floor. I told my husband we need shelves so we can clean it up and walk without falling over stuff on the floor. Yours looks great. Wow, I'm jealous! Looks great. I would be happy just having the space! Wow!!!! Your looks great!!! Our garage looks like a hot mess!! Wow Pam, that garage is great. I have a 2 car garage now and I have no room. My husband the Marine/football player has claimed 1 whole side for his gym equipment. So that leaves me with the other side for all of the stuff we moved to this house and dont need everyday, my tons of tubs filled with holiday decorations, and my paints and other misc stuff. I too need another double garage, in my perfect world. I will have a little design cottage in my next home. lol Thanks for sharing. Wow! That looks great. My garage used to be oranized vyer precisely, but not so much anymore. I have let it go downhill and now it's too big of a porject to get it back into shape. You are inspiring me to start working on it though. That floor does look great! Don't you just love the feeling that you get when you finish a big job like that. Looks great. It is so nice that your hubby helps you out. I think it makes time fly when you have someone to work with. Visiting from shabby chic cottage. Glad to see I wasn't the only one braving the heat to clean up ;-). oooo... I am so green with envy. How hard was that garage floor paint to do? What a great ideas you have suggested. Especially the selection of floor and wall paint, grey color looks nice. I have definitely use your clean up tips for may own garage. Thank you very much for sharing your experience with us. Your concrete floor looks good, but I painted A floor in the garage of a previous home. I followed the directions and used muriatic acid to etch the concrete. It looked good for little while. Then, when you pulled a car with hot tires in it seemed to pull up the paint in small areas. It got worse overtime.